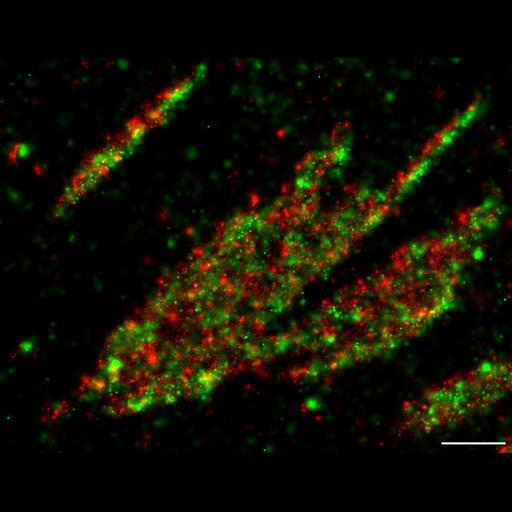 This photoactivation localization microscopy (PALM) image of tdEos-vinculin (red) and Dronpa-paxillin (green) illustrates that vinculin and paxillin are segregated into interlocking microdomains within focal adhesions. A lower magnification view that orients the adhesions on actin bundles is available as CIL 38652. Bar is 1 micron. Image made available by Catherine and James Galbraith and corresponds to Figure 5 in PNAS U S A. 2007 Dec 18;104(51):20308-13. Proc Natl Acad Sci U S A. 2007 Dec 18;104(51):20308-13. Epub 2007 Dec 12. Erratum in: Proc Natl Acad Sci U S A. 2008 Sep 30;105(39):15220.